The Hexagon International Hotel& Villas is ideally positioned only 5 minutes from the Nadi International Airport and the Nadi city centre. 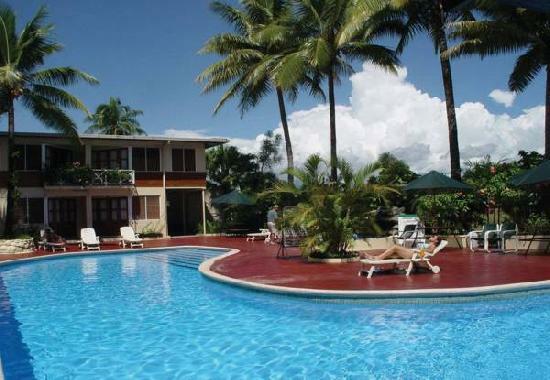 The Hexagon International Hotel & Villas is a popular budget Nadi accommodation that is perfect for holiday makers staying in the city on their way to or from some of Fiji's outer islands. Alternatively travellers can use this Nadi accommodation a central travel base from which to explore the mainland of Fiji. With a choice of deluxe hotel rooms or 2 bedroom villa resort accommodation, an undercover open air bar, lounge and newly renovated restaurant all over looking the resort style swimming pool, the Hexagon International Hotel & Villas is the ideal place to stay in Nadi for the budget conscious traveller. The hotel has recently undergone a major facelift with all furniture is made from beautifully finished local timber. There is even FREE transfers to and from Nadi Airport for International Flights when you stay at the Hexagon Hotel & Villas. The Hexagon Hotel is located close to Denarau Marina, Main City Shopping, Temple, Traditional Village and the Garden of the Sleeping Giants. Guests can swim in any of our three pools, visit the tour desk and organise day trips to the islands, village visits, cave and waterfall tours, snorkelling and scuba diving or simply sit back, relax and enjoy massage and beauty treatments.